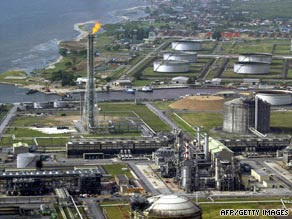 Royal Dutch Shell Plc (RDSA)’s Bonny oil terminal in Nigeria returned to normal after operational problems, according to a company official. “Bonny is operating normally,” the London-based official said in an e-mail, declining to be identified in line with company policy. Five cargoes of Bonny Light were added to loading programs for May and June, according to revised schedules obtained by Bloomberg News. Four 950,000-barrel shipments were added to the May plan, bringing total exports for May to 10 cargoes, or 306,452 barrels a day, the programs showed. Exports of Bonny Light for June were revised up to eight cargoes totaling 243,333 barrels a day after one 650,000-barrel consignment was included, according to the programs.